I am a Travel Smith catalog junkie. I never purchase anything from there – I just read all about the clothes and the shoes and the leather bags and (jokingly) wish I lived a life of a leisurely traveler – A frequent rider of the Orient Express, a regular shopper in the streets of Bombay, an expert at driving a 4-wheel drive through the Serengeti. Gregg and I often joke about being independently wealthy and traveling the world, homeschooling our children, doing research for our books. But, I cringe at the costs. Their clothes are too expensive for what I give myself as a budget for my wardrobe. So, I just window shop. When I booked my trip to Abu Dhabi to visit Gregg, I went to Travel Smith’s website and checked the “Clearance” tab. Imagine my surprise to find their “Ultimate Travel Skirt” marked down from about $80 to about $20. I couldn’t help myself — I bought one. Let me just say that when it came in the mail, if I’d paid $80 for it, I would have been disappointed. The material felt very thin and very cheap, and when I ironed it, I singed it right away. But, after wearing it for a 20-hour travel day, from Pittsburgh to Paris to Amsterdam to Dubai, this skirt lived up to its promises. In the very front, and to the inside instead of outside, is a pocket that is wide enough and long enough that my passport and a small ID wallet fit in without even messing up the dress line. I felt less stress about possibly losing my purse or laptop bag, because my essential identification and money were on my person, and out of the way in a velcro-closing pocket. The front pockets are deep – my hands fit in probably to mid forearm. 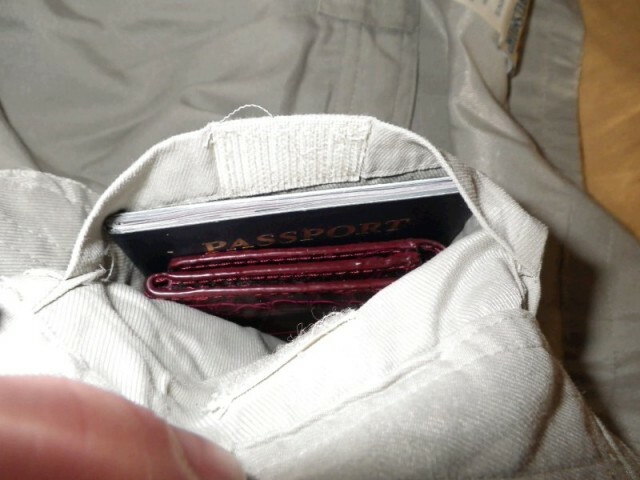 I could even stick my airplane tickets in them while going through security or when I needed a free hand. I never looked wrinkled and I never felt wrinkled. My only problem with it is that it was too short. I’m very tall, and I love skirts that are very long. This one hit just below mid-calf. Otherwise, I think it is the ultimate travel skirt. Not that I’d pay $80 for it, but I was very happy with what I got for what I paid. You know Hallee, when I read your writing, I feel like I sitting down with a friend over tea. You could make peeling wallpaper interesting. 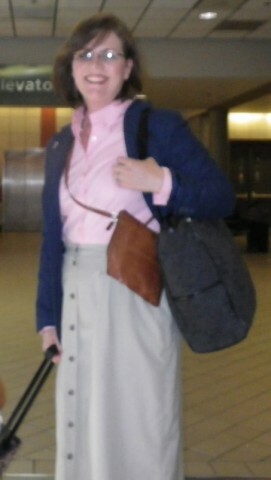 I really like this article on the travel skirt…I think a lot of your fans will. Who knows, maybe you will start doing “OutFit” posts for your section of the blogging audience! Keep up the great work girl. Oh…Stumbled you too! Thank you so much my friend. I love it that God brought us together.